Kani Pershia is an active mining company which is registered as a limited company in the fields of exploration, extraction and processing of metallic and non-metallic mines in the year of 2006 in East Azarbaijan province. 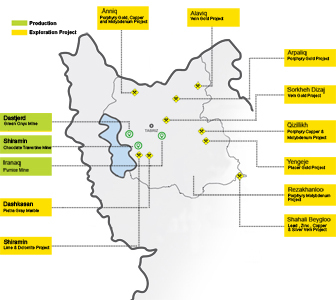 Mainly, our activities are located in Azarbaijan province which is one of the high potential zones in the mine sector. On this basis, by using technical skills and proper investment and also searching new opportunities, we started new goals to increas sources, reserves, capital and also raising production level. At this time, our company main focus is on completing necessary exploration works in our capable exploration areas for gold , copper, silver, molybdenum, lead and zinc. Copyright © Kanipershia 2015. All Rights Reserved.